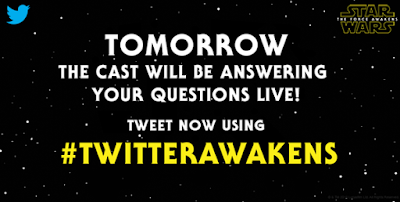 The official Star Wars Twitter account announced that tomorrow at 6pm EST (3pm PST) the cast of Star Wars: Episode VII The Force Awakens will be taking part in a special Twitter Q&A. 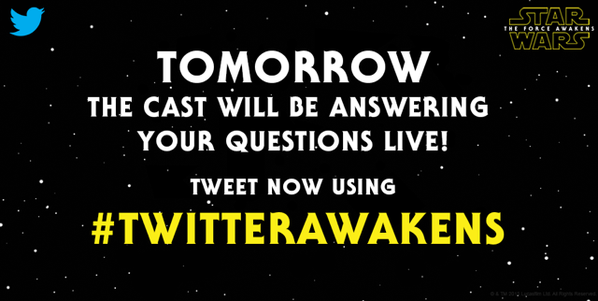 You can begin sending in questions now using the hashtag #TwitterAwakens. No word yet on which cast members will be taking part in the Q&A, but if I had to venture a guess I would expect the focus will be on new members of the cast like John Boyega (Finn) and Daisy Ridley (Rey). What questions do you plan on asking the cast? Let us know in the comments below.